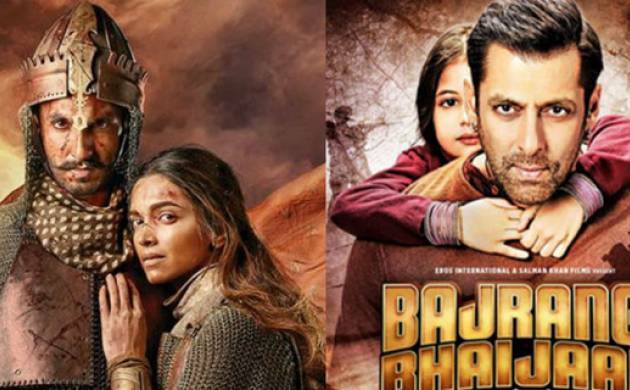 The Bollywood titans of 2015--“Bajrangi Bhaijaan” and “Bajirao Mastani”—emerged victorious at the International Indian Film Academy (IIFA) Awards 2016 with the Salman Khan-starrer winning best picture while Sanjay Leela Bhansali’s magnum opus taking home best director gong. Director Kabir Khan heaped praise on his lead star as he accepted the best picture award at the 17th edition of the awards, held here. Bhansali was honoured with the award by his lead actors— Ranveer Singh, Deepika Padukone and Priyanka Chopra. “No other film of mine has got so much love like ‘Bajirao...’. I am surprised to see how it has done so well this awards season. It is a special moment for me to get this awards by my three favourite actors. I don’t want to thank anyone for the film because a ‘thank you’ is not enough,” the director said. The historical romantic saga earned Ranveer the best actor trophy for his portrayal of the great Maratha warrior Peshwa Bajirao. The actor began his acceptance speech by thanking his director but did not miss a chance to show his affection towards rumoured girlfriend Deepika. “I am so glad I won. I left ‘Befikre’ shoot to come here. I have to thank Sanjay sir. I love you. “There’s another special person I must thank. I was moved by her performance on ‘Bajirao’ songs during the show. She is the Leeela to my Raam, Mastani to my Bajairao and I don’t know what’s next. Girl, you are so fine. Nothing makes me happier than you... I mean winning an award here with you,” the actor said. Deepika, who was nominated for two films in the best actress category, won the honour for Shoojit Sircar’s “Piku” thanks to her sincere performance of a cranky yet responsible daughter. The 30-year-old star dedicated the award to the film’s writer Juhi Chaturvedi and all those, who work behind the scenes. “I want to thank Juhi, who made my performance worth while. I thank all spot boys, light men who work so hard,” she said. Deepika also mentioned a “special someone” in her speech, though without naming the person. The night belonged to “Bajirao Mastani” as Priyanka was honoured with the best supporting actress award. The actress said she wanted to share the honour with her co-star and fellow nominee Tanvi Azmi, who is the National Award-winner this year for her work in the movie. “I am overwhelmed. I thank Ranveer, Deepika and Sanjay sir,” Priyanka said. “It is difficult to go to another country and do things. I want to thank all my fans for being so supportive,” said the newly-turned global star. Priyanka’s “Dil Dhadakne Do” co-star Anil Kapoor won the best supoorting actor for his confident performance as the patriarch of a rich Delhi business family. Deepak Dobriyal won the best performance in a comic role for “Tanu Weds Manu Returns” and the best performance in a negative honour was bagged by Darshan Kumar for his act in “NH 10”. “Raman Raghav 2.0” star Vicky Kaushal bagged the best debut actor (male) for his endearing act in “Masaan”, while Bhumi Pednekar took home the best debut actor (female) for “Dum Laga Ke Haisha”. The YRF film also ruled the music categories with Papon winning best male playback singer for “Moh Moh Ke Dhaage” and National Award-winner Monali Thakur bagging best female playback singer for the same song. The track’s moving lyrics helped Varun Grover win his first IIF for best lyricist. “This proves that you don’t have to be a Prime Minister to go abroad,” Grover joked. The best music composer honour went to Meet Bros, Amaal Malik and Ankit Tiwari for “Roy”. The “Jodi if the Year” honour went to “Hero” stars Sooraj Pancholi and Athiya Shetty, who thanked their mentor Salman for giving them a break in the Hindi film industry. The evening was hosted by Farhan Akhtar and Shahid Kapoor who returned to take on the anchoring duties for the third time at IIFA. The duo reprised their Pappu and Raju roles from the ealier editions and kept the audience entertained with their one-liners and digs at the controversy-ridden censor board and the last year’s row over returning awards. The high octane performances by Bollywood stars brought the house down during the ceremony at IFEMA here. Hrithik Roshan was the first performer of the evening. His heart-pumping act on songs “Ek Pal Ka Jeena”, “Bawre Bawre” and “Senorita” served as the perfect opener for the show. Priyanka made the audience go wow with her seductive, jazzy rendition of her hit tracks “Ram Chahe Leela”, “Aaj Ki Raat” and “Dil Dhadakne Do”. Besides, she also danced to “Gallan Goodiyaan” and “Pinga”. Tiger Shroff paid tribute to his two idols- Michael Jackson and Hrithik through his performance. Sonakshi Sinha paid homage to Sridevi as she danced to the tunes of the veteran actress’ popular numbers “Taki Taki”, “Hawa Hawai” and “Naino mein Sapna”. But, naturally the most anticipated performance was Salman’s. The superstar, whose act closed the ceremony, went back in time and kickstarted his act with his old, slow hits like “Tadap Tadap Ke”, “Humko Maloom Hain”, “Sau Dard Hain”, and gradually moved to more recent hits like “Prem Ratan Dhan Payo”.